Really bright, rich purple in the glass. The nose offers up sweet cherry concentrate, with blackberries and dare I say- banana? On the palate the wine is super smooth, polished and oozing blackberry coulis, sage and creosote. The mid palate shows off some delightful dryness from the juicy tannins. The overall mouthfeel is really nice, starting out very smooth, building on a dryness and finishing with a tannic yet acidic bite. Tasty. The dark fruits carry on throughout. You could pair this wine with many dishes or just drink it alone, but the back end grip really calls for Ribeye. Plain and simple. 94 is what it gets from me and the pros. This is a big wine folks. 5 stars only because I can’t give 6 for this amazing $17 bottle. Drink till 2028. Salut…. We went to dinner after our tasting where we had the Beringer decanted. At 19 years of age I was shocked. Below are my tableside notes after numerous other tastings that afternoon. Youthful and tannic with fruits that still pop. A nose of plum compote, blackberry torte. Fresh and lively after 19 years in bottle. Amazing bottle. 93 points easily. Cassis, plum and leather come out on the initial attack. 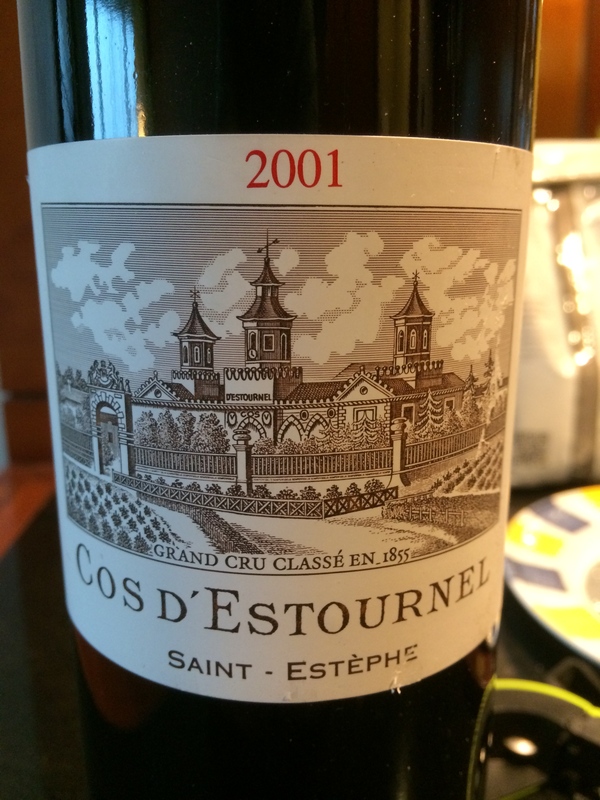 Mid palate shows a slight hollowness but this is overcome by a longish finish that exhibits crushed stone, black stone fruit and a dryness that begs for a juicy steak. The tannins are still evident as is the fruit and acidity. This wine has plenty of cellaring potential yet but is delicious right now. I think you can still find it online for $100. 4 stars all day long, bordering on 5 stars. Salut…. If you have read any of my Clarendon posts you will know that I love this winery and can’t get enough of their subtle yet complex Syrahs, Cabernets and Grenaches. This particular Mclaren Vale offering was opened to go along with my new favorite grilled meat- Chorizo. I loaded up two giant Ribeye steaks (the butcher had labelled them Delmonico’s, all hoity toity) some onions and a half dozen of the Mexican sausages on the charcoal grill and opened this beauty to sip while I got the rest of dinner ready. Thick purple color is always a good start for Cabernet Sauvignon. Fresh blue fruits with some mint greeted my flaring nostrils- perhaps a touch of alcohol was coming off the glass. Unique plum compote and blueberry coulis flavors were my initial impression but I began to think the wine is still primal with full fruit and a whiff of heat attacking the mid palate. Moderate tannins and cutting acidity belie a still young wine waiting to mature. Eucalyptus and mulberry came into being on the back end with cassis and red fruits adding to the long finish. The 14.5% alcohol was hidden after a while, blown off from it’s early attack. The wine is structured, balanced and a joy to drink. I would imagine it could cellar for another 15 years easily. $75 and 94 points from me make this a treat of a wine that gets 5 stars for a special occasion. Salut…. 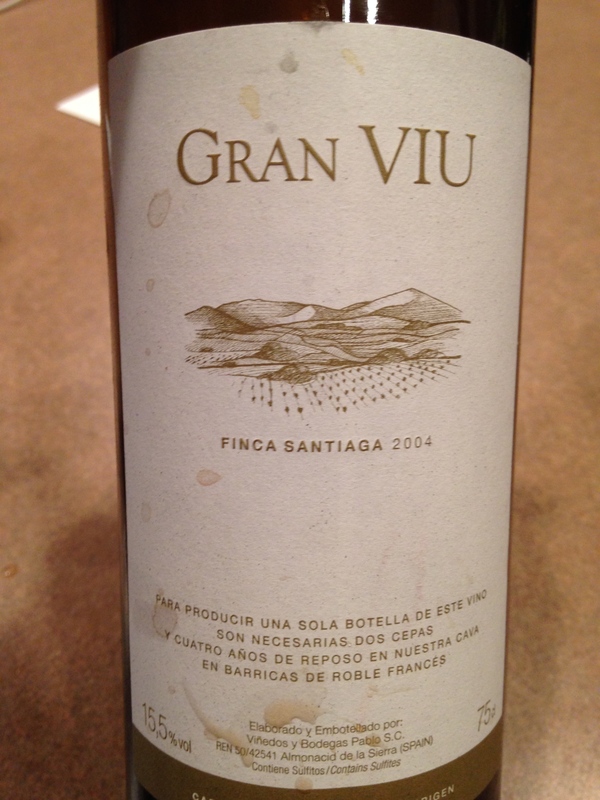 Wow, this wine was good….Blackberry and herbs on the nose after coaxing, it seemed closed at first but opened nicely. Juicy acidity, melded tannins and a core of black fruits with an earthy touch were my introduction. The wine is big, bold and powerful, packing a 15.5% punch which never showed up. Plums on the mid palate with some teeth searing tannins became evident as the wine evolved. What had started out as a mature wine quickly transformed into a rather young wine (at 10 years of age already). I timed a long finish with some road tar, black berries and orange peel on the tail end, quite complex. This wine is till too young- 2015-2025 would be my guess. It is a blend of Grenache, Carignan and Vidadillo from Aragon in Spain. It got high marks from the pro’s and I agree with their 94 points. I found it online for about $60. 4 stars for this complex wine with great cellaring potential. Salut…. 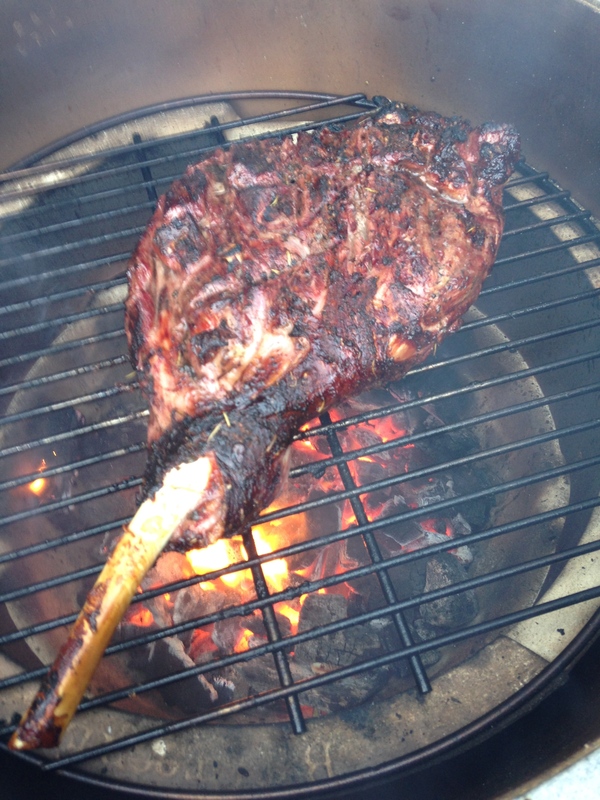 When I decided to fire up the grill and roast a leg of lamb I needed a Syrah/Shiraz to go with it. What better than a nicely aged bottle from Australia? I have become a huge fan of the Clarendon winery, they produce amazing wines in a style that I adore. This one was exceptionally good and the pairing was amazing. It started out with Plum jam, blackcurrants, nutmeg and a touch of heat on the nose. Initially there was a dark core of black currants and plum compote with a hint of licorice. The mid palate gave way to red raspberries after some time which was fascinating. I noted ‘Extremely smooth with beautiful fine-grained tannins and an edge of acidity’. This wine rocked. It’s 14.5% alcohol was evident when the bottle was first opened but seemed to blow off with time and became a non-event. Complexity and finesse are what this winery is good at. They tend to be more Rhone-like versus typical Aussie Shiraz. I prefer the subtlety and refined approach on occasions and this wine allowed the meat to showcase it’s herbs and spices without overpowering it. The pro’s went from 89-95 on this one, but I agree with WS- it’s a solid 93-94 point wine in my opinion but at $75 is rather pricy. 4 stars however and a cellaring potential up to 2027 if you ask me. Salut…. 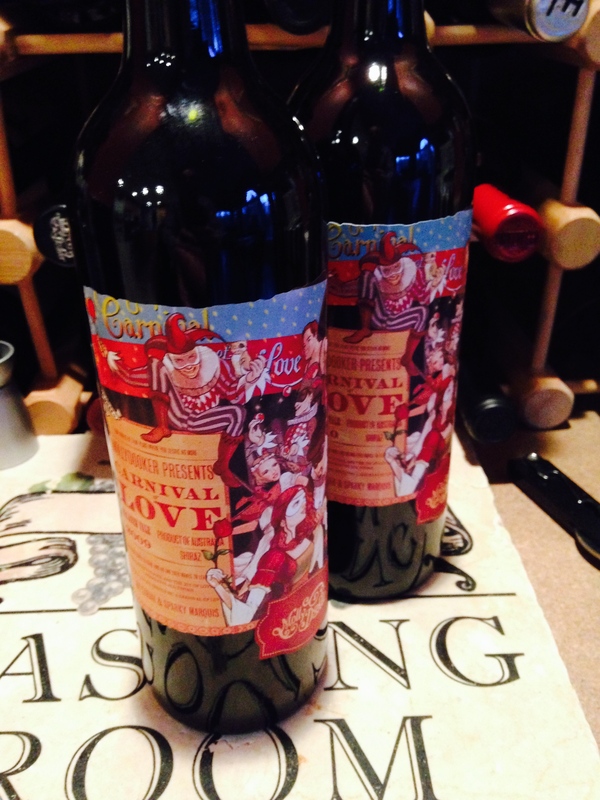 The fourth vintage of this wine for me and served on Valentine’s Day, how appropriate! I really enjoyed the previous three and was slightly hesitant about opening such a young wine but in the interest of keeping the momentum going on my vertical tasting I delved right in. I ran the first glass through my Vinturi to give it some much needed air and then I performed the ‘shake’ on the bottle to open it up some. The telltale inky purple color was ever present and the nose was quite alive after I shook the bottle. I got a brambly nose of blackberry and cassis with some plums. On the palate it became much more interesting with dark chocolate, oak, blackberry and more cassis. I did not get the same blueberry core as the 2011 vintage, this one being more brooding with the black fruits in prominence. I did get a good dose of the really tidy tannins which were ever present yet unobtrusive. A fine grained dryness on my gums and teeth rather than a full blown case of tannins was quite tasty. My son told me he could smell the wine when I poured another glass, he was sitting more than 2 feet away from me. I asked him to describe what he could smell- “Dark red grape”. Pretty much sums it up from an 11 year old’s point of view. This wine is delicious, with complex fruit structures and fine tannins. I did get a whiff of the 16% alcohol initially, but it soon subsided. The last glass contained a bit of sludge which surprised me a bit, so you may want to decant or at least keep an eye out when nearing the bottom. I don’t know what the pro’s gave it but I am going with 94 points and for $75 this is a 4 star wine in my books. Recapping my last four nights of Love…. The 2009 was amazing, getting 94 points and 4 stars from me for it’s concentration, balance and complexity. The 2010 could best be described with a picture of a bowl full of black and blue berries. The wine was open, opulent and refreshing with its lively acidity. I gave it 92 points and 3 stars. The 2011 was the most aromatic and complex so far and had an incredible concentration of blueberry that had me reeling. It got 93 points and 4 stars from me. The 2012 is the baby of the group but I reckon it may be the best one yet, giving the ’09 a run for the money. I believe it will evolve and gain complexity like the others have, and the tannic structure will hold it in good stead. It too got 94 points and 4 stars. 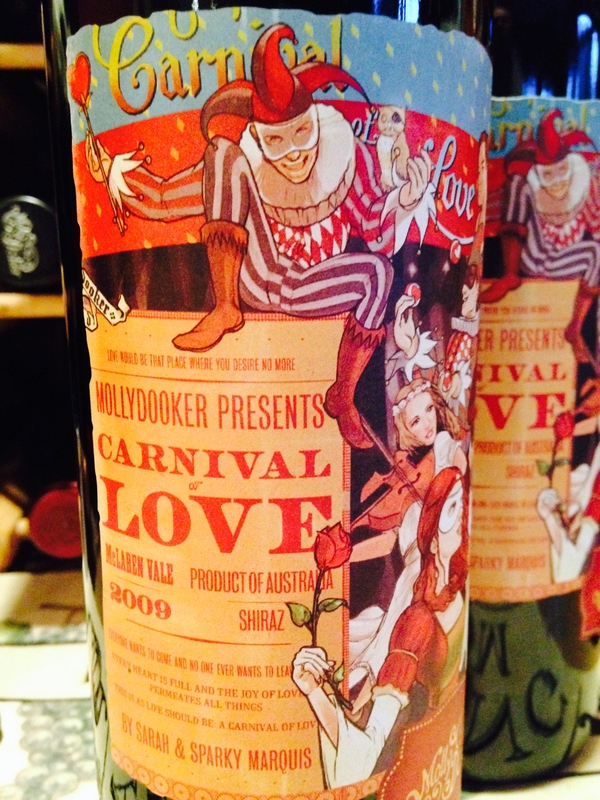 The one main factor that I have noticed with all of the Mollydooker wines that I have tasted thus far is their level of concentration and their relative ease of drinking at such young bottle age. 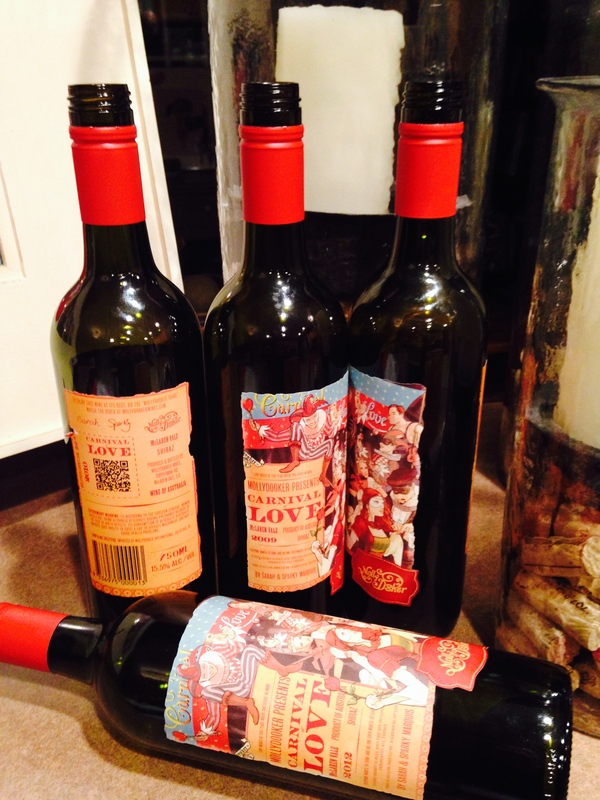 The wines all share some of the telltale signs of the house style and I really like it. Very rich, focused and balanced. The more reasonably priced wines are delicious for everyday drinking while the upper echelon have proven to me that they can hold their own on any festive occasion against a variety of foods. Most of them are relatively high in alcohol but this has been very cleverly disguised by the excellent wine making. You cannot get such concentration and complexity without pushing the boundaries but they have done so in a great fashion. I will continue to drink my way through the current vintages of Mollydooker and look forward to what the 2013 vintage brings. Salut…. Once again, I lost the Fantasy Football bet and my friend Lemming got his way with an aged Bordeaux. His flight was delayed so he met us at the restaurant for our New Year’s dinner. The corkage was not cheap on this, but well worth the price. The last time I drank ’01 Cos was in May of last year. The wine has officially hit its stride and is performing like a show dog. 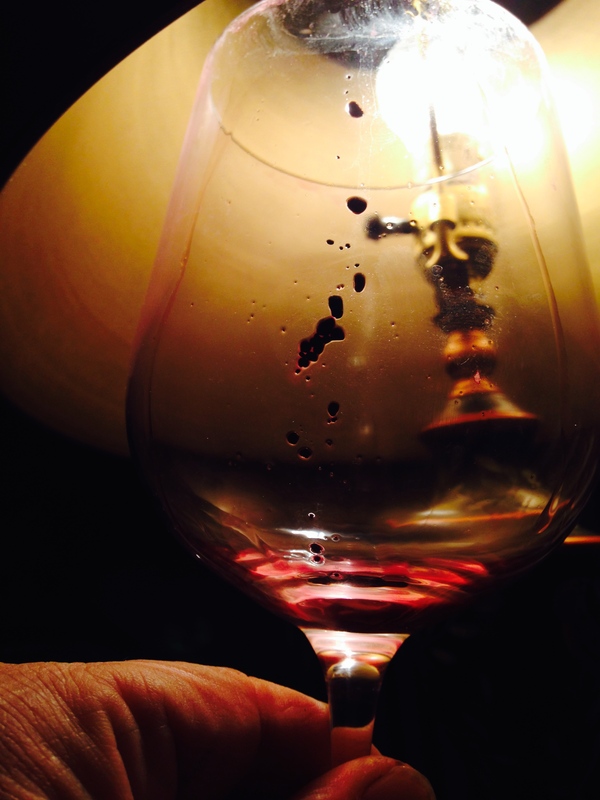 A lighter shade of purple in the glass was a telltale sign of the wine’s maturity. The primal fruit and puckering tannins have dissipated into a mellow and smooth wine offering up plums, tobacco, earth, leather and violets. The finish is long and the balance is great. Having cellared this wine for over 10 years I find myself well rewarded and happy to have been able to share this bottle with 8 others. I look forward to the next 10 experiences that I have with the remains of the case. This wine originally received upwards of 94 points from the pro’s. I agree. I paid $70 back then, it goes for about $130 these days. I have to give it 5 stars! Salut…. I will preface this post by telling you that this is perhaps my top 3 wines of all time. I bought the case in Paris and hand carried the bottles over when I was working in Europe, two at a time. I have savored this revered nectar and opened it only on special occasions. Last night our very best friends came to visit. We have not seen them in nearly 18 months and ‘Tom’ and I enjoy wine on a grand scale. I prepared for the evening by buying a Beef Tenderloin, carving out 4 monster Filet Mignons. Moxie did the rest; Bang Bang Shrimp and roasted Broccoli with Sweet Potato and Garlic. My only mission was to fire the charcoal and uncork the gem. !7 years young and still marching on. Dark purple in the glass it exploded on the nose. I used the BAGs (Big Assed Glasses) and they came unto themselves. 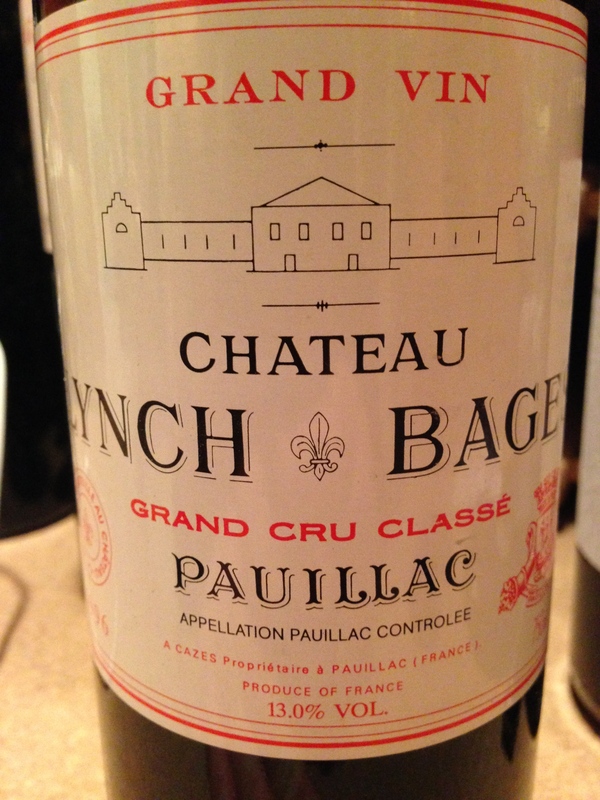 The aromas were generous of cassis, tobacco, plums, black berry and tar. This was probably the most impressive sniff I have ever gotten from a wine. On the palate, gorgeous caressing tannins offered up waves of dark fruit, the cassis was amazing and the earthy factor from an aged Paulliac was spot on. Textbook Bordeaux. I cannot imagine anything finer than the pleasure this wine has offered me over the many years of watching it evolve. 94 points again from me and for sure a 5 star wine. I paid $60 back in the day. I look forward to enjoying my later vintages of this wine over the next 15 years. Salut….